Brilliant evening at the Bingo Night tonight! 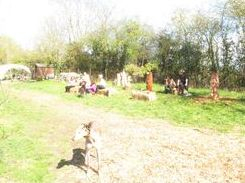 Thanks to Megan and Kim for all their hard work, thanks to everyone who attended and helped by bringing some food and additional raffle prizes. Hope you all enjoyed yourselves. The final amount was an amazing £720.04 - we are extremely grateful to all the lovely people who support the work we do. Thank you to Mr S Williams for his kind donation in memory of his late mother Doris. Some good news to start the week. Jessie has found her new home in Winford with the Stickley family. Such a sweet, loving girl and we hope you have a long and happy life. Thank you for giving Jessie a second chance in life. More good news!! Mitts has also found her forever sofa in Cliftonwood with the Green family. Mitts came to Bristol DAWG from a home environment, after a bad start in life. Luckily she was only with us a short while. Enjoy this special girl. The things the trustees have to do for Bristol DAWG! Hilary was invited to attend a company called Taste Tech today to judge their Easter Bake competition. As you can see, it was very well supported and, naturally, she had to taste all the entries which, as you can imagine, was a great hardship! The overall winner was made to a traditional Lithuanian recipe and DAWG was a winner too, being presented with an incredibly generous £1,000! Thank you Taste Tech! 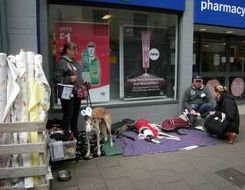 Thank you Barbara, Lynne and Dave for flying the flag for Bristol DAWG at a Street Collection today and raising an amazing £263.20. The lovely boy on the left deserves a special mention, Rudi, who belongs to Barbara, is now fifteen years old and still out doing his bit to help dogs less fortunate than himself. What a star!! 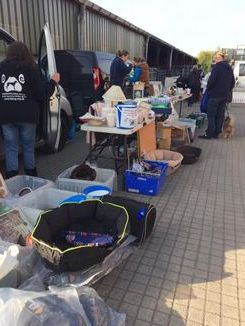 Gerry, Jane, Kim and Megan undertook a car boot sale today at Washingpool Farm, Easter Compton, raising more than £400! An amazing sum - well done ladies and thank you. 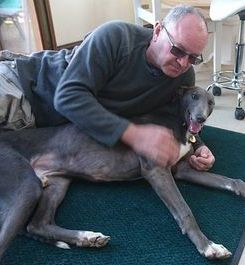 Gerry has been to Coalpit Health today to make Smokey's adoption official. Julie and Adrian have been fostering Smokey for just over a week and have already failed as fosterers, but I can see why, as this boy is absolutely wonderful. Smokey is living with four other dogs, two pigs, chickens and koi carp - he is not bothered by any of the other animals, super laid back!! Must tell everyone this is the second time they have become "failed fosterers" as they adopted Pearl from us in November last year. Thank you Julie and Adrian for giving both of them such a lovely home. Thank you also to Eila Moloney for sending Smokey to Bristol DAWG. 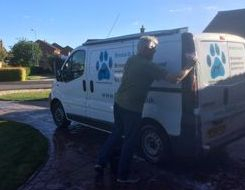 Thanks to Norman Worth for giving the charity van its annual clean!!! Just one of the things we never seem to get time to do, didn't know we had a white van!! Thanks Norm brilliant job with your scrubbing brush. Gerry spent a lovely hour this morning with the Rainey family in Brentry making Rosie's adoption official. They have recently lost their much loved lurcher and felt they wanted to give another homeless hound another chance in life. Rosie is going to have a lovely life, company all day, good food and lots of long walks. Thank you for giving her a wonderful new home and thanks to Sharon Mackenzie for bringing this lovely girl to Bristol DAWG. Thanks to Claire and Marcus, who have been to the kennels today, we have a couple of pictures of the new girls who arrived in the early hours on Thursday morning. Black girl Ruby, Blue girl Birdy - both lovely. Thanks also once again to Kristie and James for getting up at silly o'clock to welcome them to Tonew. 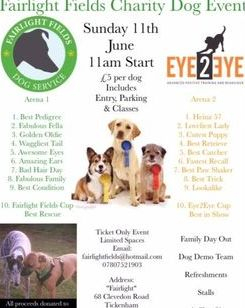 Thanks to Kristie and James for getting up in the early hours today to welcome Star and Bronagh, both lovely dogs. Thank you to Eila Moloney for sending them to us. 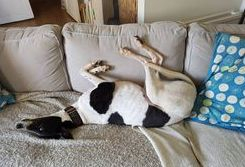 Brilliant news, Brandy, a young lurcher who was handed in by a member of the public, has found his forever home in Wells, Somerset with the Durkin family. 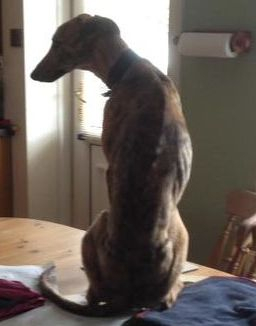 Thank you for giving this super lad a lovely new home and so pleased to hear that he has settled in well, despite sitting in the middle of the kitchen table to see out of the window!!! Meet Brad and Lily who will be making their way over the Irish Sea next week in search of forever homes. Thank you Eila Moloney for saving these lovely dogs. 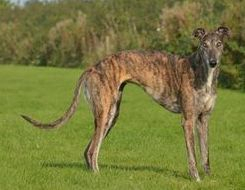 Many of you will remember the two greyhounds (Woody and Martha) which were on a "Working Dog" page for £20 each!!! said to be "too fat to work". Gerry spent a lovely hour in Clevedon this morning with Jayne who has adopted the very handsome Woody - OMG has this boy landed on all four paws. He is living with three other dogs, so has lots of company and it is very clear that Jayne is totally smitten with this lovely boy. Massive thanks to Jess and Andy Ward for very kindly fostering Woody whilst he was waiting for his forever home, and we also have to say a big 'thank you' to Mandy Jones and Kristie Davies for acting so quickly in collecting these dogs, as their story could have been so different!!! Bristol DAWG will see Woody regularly as he has started to fundraise, and is a super fundraising dog. 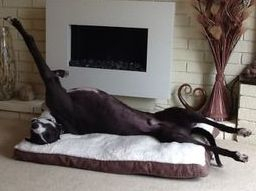 Think you can see Woody is enjoying home life. 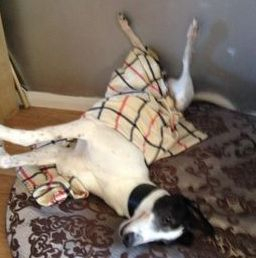 Not only has Woody been adopted but so has the lovely Martha. Martha has gone to live with Barbara and Colin in Devizes, lots of open countryside and brilliant long walks, how life has changed for both these dogs. Again huge thanks to Mandy Jones and Kristie Davies as life could have been so different had they not acted so quickly. Massive thanks to Sharon Hunt who very kindly fostered Martha whilst she was waiting to be adopted.